Future Energy Systems HQP David Miller, Calynn Stumpf, and Jason Michaud. David Miller spent eighteen months trying to get the engine he built to run. Then he found a graph that told him not to bother. That data was buried on page 181 of an unpublished and unreviewed document that researchers usually wouldn’t rely on, but it showed that someone else had gone down the same path he was trying –– before hitting a brick wall. His time spent struggling fruitlessly against the laws of physics is now a chapter in his soon-to-be-completed Master’s thesis –– one that will be published in full, so no one who follows his path into Stirling engine design will wander down the wrong track. 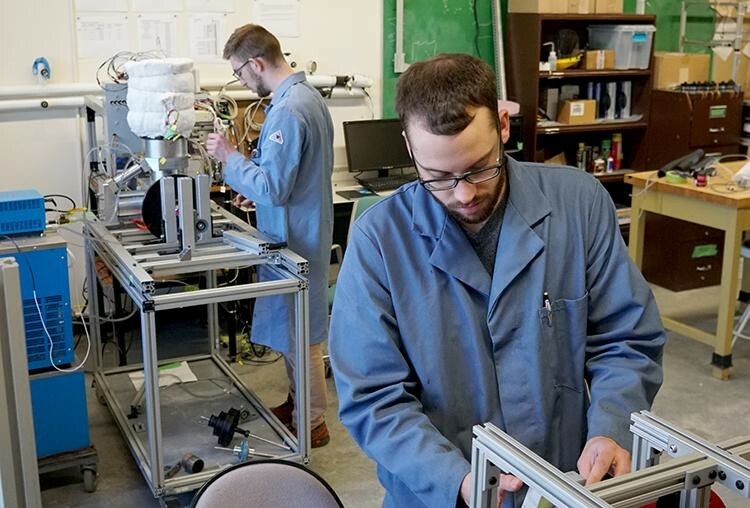 David is an engineer in the most classic sense: along with his fellow Master’s students Calynn Stumpf and Jason Michaud, he builds engines in the University of Alberta’s Dynamic Thermal Energy Conversion Laboratory (DTECL). But these are different engines than the ones in our cars –– they’re called Stirling engines and are based on a 200-year-old design that converts heat from any source into electricity. Since the heat doesn’t have to come from the burning of hydrocarbon fuels, that means they can generate electricity without any carbon dioxide emissions. As part of Dr. David Nobes’ team in the Future Energy Systems project Optimizing Geothermal Energy Production and Utilization Technology, David, Calynn and Jason are redesigning these engines to work with renewable heat sources. With every roadblock they overcome, they’re moving their designs closer to potentially remaking the geothermal energy landscape. Their main challenge: building Stirling engines that run at an ultra-low temperature differential, and then creating a model that their successors can use to scale up. 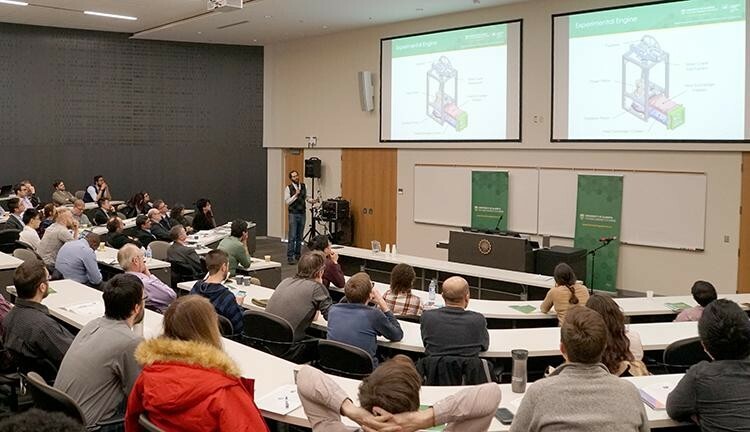 Explaining what an ‘ultra-low temperature differential’ means is something Calynn Stumpf is good at –– the 6 foot 7 master’s student with the formidable beard won an award for pitching his Stirling engine at the Future Energy Systems Research Symposium in March. As pressure cycles back and forth from one side of the cylinder to the other, the resulting movement of the piston turns a shaft, and the energy from this rotation can be converted into locomotion, electricity or something else. Being able to draw energy from a temperature difference has the potential to be very useful –– NASA is even looking at Stirling engines (dubbed ‘Stirling converters’) for applications in space and on Mars. But what’s an ‘ultra-low temperature differential’? What he and the rest of Nobes’ team are working on goes one step further: engines that will run on an ultra-low temperature difference. In other words they want an engine that could turn over when the warm side of the cylinder is 95 degrees Celsius –– hot enough to make some ramen or a decent cup of coffee –– while the cold side of the cylinder sits just above freezing. That would turn the low-temperature geothermal energy abundant in Alberta into a viable source of power. Technology capable of getting energy from ultra-low temperature differentials now surrounds David, Calynn and Jason –- and they’ve built most of it themselves. But the job isn’t done, and one of the first things they need to figure out which engine designs are most viable. Jason Michaud’s ‘alpha-type’ Stirling engine design is different than the other ‘gamma-type’ engines in the lab around him. The gammas have two independent pistons –– a displacer piston to shuttle the gas back and forth so it can be heated and cooled, and a power piston to extract energy from the corresponding pressure change. An alpha utilizes two pistons which work as both power pistons and displacer pistons. Visually, the gammas stand upright with their cylinders offset, while Jason's alpha is basically a single large tube turned on its side –– a simpler form factor that might make it easier to scale up. He still has to find out whether an alpha-type will generate more or less power than a gamma-type at the same temperature difference, and that’s proving to be easier said than done. Taped to his workbench is a flow chart with instructions: Are you Jason –– yes or no? If yes, touch the engine. If no, is Jason with you –– yes or no? If yes, do not touch the engine. If no, do not touch the engine. It’s hard to say whether that apology was necessary, since the engine is currently in pieces. Two pistons are facing each other, but the cylinder that will house them them is sitting on the shelf below. This is the beginning of Jason’s second major attempt at building this design –– one he hopes will work, because the first one leaked too much air to even start turning over. After numerous futile attempts to seal its leaks, Jason ultimately decided to disassemble that 3D-printed engine (which can still be seen in Future Energy Systems promo materials and on the program’s Facebook page). 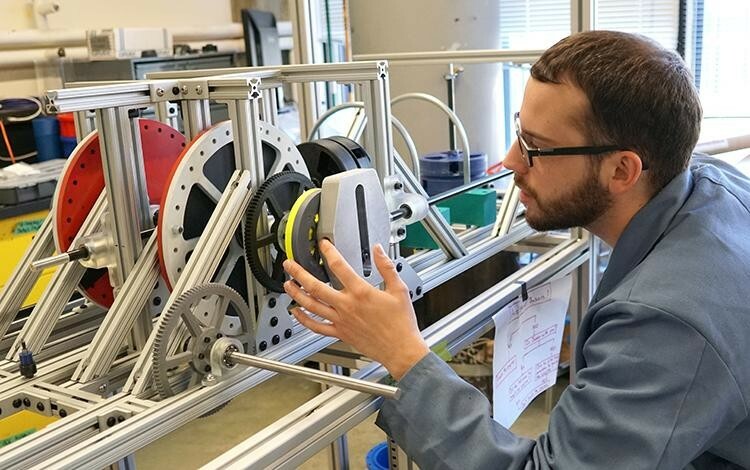 Now he’s printing components to fit inside an 8-inch pressure-tight plastic pipe which he believes will give the alpha-type its chance to run. “I’ll hopefully get it turning next week,” he says, looking from his collection of parts to the gamma-type engines around him –– all of which turn over regularly. The delay has been frustrating for the engine-maker, but the discovery was crucial to the future of the project. Like the unpublished data that David found, this materials knowledge will help shape upcoming prototypes by informing a new Stirling engine model. “Mechanical energy is weird,” Calynn declares as he points to one of the gamma-type engines. In other words, you’d need 240 of these bench-scale Stirling engines connected in series to power a single 60-watt light bulb. Such a low output is not likely to shake up the world of energy generation, but the way to get more power is simple: go bigger. “When we talk about scaling up, we literally mean we need to make these things bigger,” David explains. Scaling up is complicated. Even after working designs are selected and the properties of potential materials are understood, gauging how much energy will come from an engine of a particular size requires accurate modeling. To date, this team’s models have all focused on simply getting engines to function; a new model is needed to predict what power outputs are realistic. Creating that model takes data, which comes from the engines David, Calynn and Jason have built. Even though the model isn’t quite ready to tell them what the exact scale will be, all three are able to visualize the possibilities. David, Calynn and Jason all hail from Alberta –– David from St. Paul, Calynn from Lacombe and Jason from Sherwood Park –– so they can easily picture massive Stirling engines dotting the landscape, taking advantage of the province’s low-grade geothermal heat. “One idea is you build these engines in shipping containers, then bring them to a place that has a geothermal reservoir and stack up as many as it takes to get the power you need,” Jason explains. It’s an exciting prospect –– exactly the sort of technology that draws clicks on Facebook, because it’s easy to visualize and promises to revolutionize access to energy for countless people. “And even after you use it for heating, that water could still be used for something like heating a fish farm,” Calynn suggests. “Or you could just pump it back into the ground to heat it up again,” Jason finishes the rally. 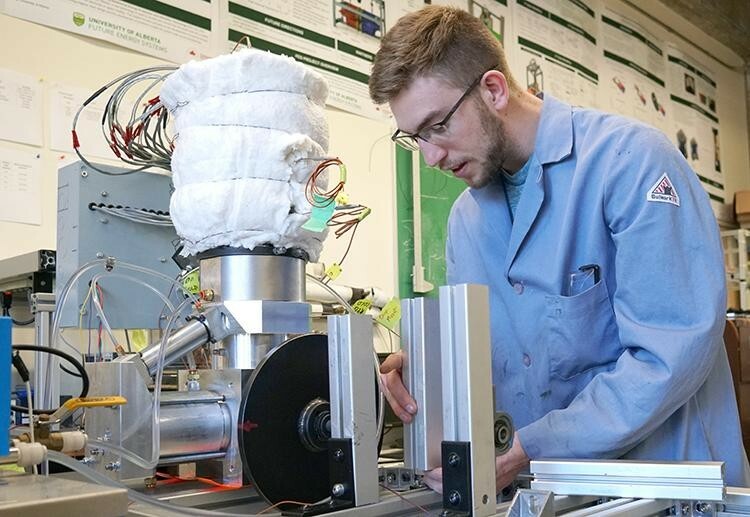 Every step they’ve just described is another engineering challenge –– each one perhaps the thesis for another Master’s student who will pass through this or another University of Alberta lab after they’ve all graduated. Together they’re just focused on getting one essential component of that possible energy system to work. “It’s a great job,” David agrees. “I come in on the weekend sometimes,” Calynn confirms. They’re all enjoying this challenge while it lasts –– and imagining ways to keep it going. Graduation looms for all three of these Master’s students, and they’re not sure what the real world has in store for them. They’d like to keep working with Stirling engines, but whether a company would be ready to jump into such experimental work is difficult to say. Still, developing the technology has been an extremely valuable exercise for all of them. “These things are a generalist’s dream,” David gestures to his engine. But all three are practical. 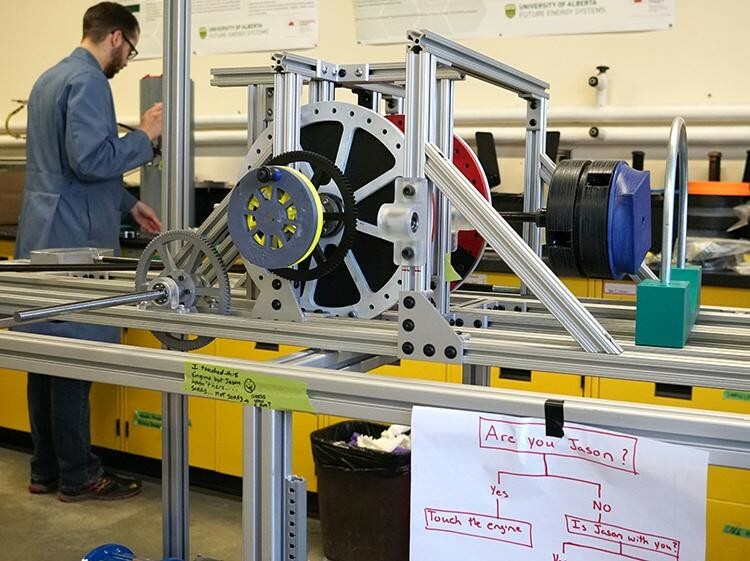 While the next team of students in Nobes’ lab use their model to begin working on larger and more efficient Stirling engine designs, they’ll take valuable experience away from the Future Energy Systems project. From learning the fundamentals through design, CAD, manufacture, assembly and testing, they’ve experienced technological development from all sides –– and learned many lessons in the process. Those lessons will apply to any work they pursue in the field of renewable energy, where expectations are high but knowledge and experience are still catching up. “You learn to figure out why things don’t work –– and then figure out how to make them work,” Calynn concludes. Hopefully not. Along with 1,000 other University of Alberta graduate students who are set to pass through the Future Energy Systems program in the next few years, David, Calynn and Jason will have plenty of work to do on the technologies that shape all of our energy futures. To learn more about Optimizing Geothermal Energy Production and Utilization Technology, click here.